While developing those molecules—and the computers that could take advantage of them—will demand much more research, the current findings demonstrate a level of precision work not previously achieved. 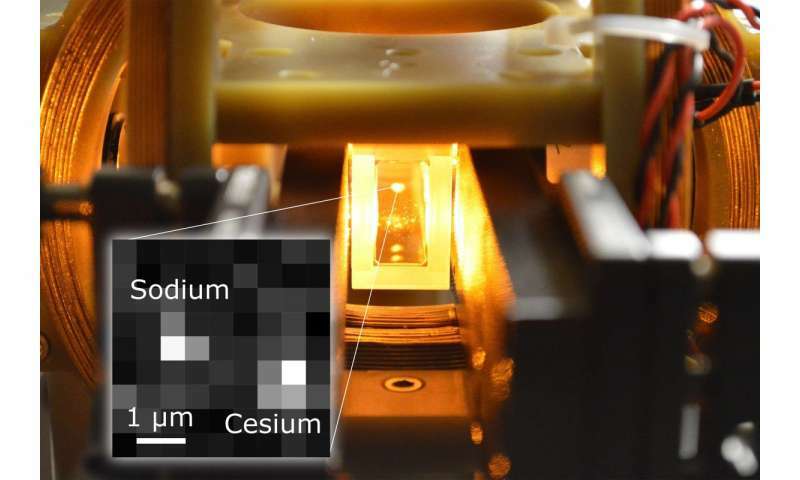 The team led by Ni, however, began with just two atoms, one sodium and one cesium, which were cooled to extremely low temperatures where new quantum phases beyond gas, liquid, and solid would emerge. 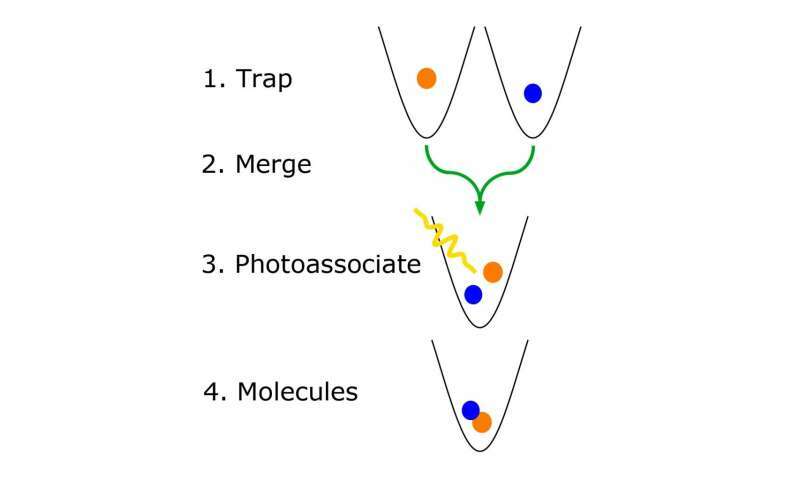 Researchers then captured the atoms using lasers and merged them in an optical dipole trap. While the two atoms were in an "excited state"—that is, electrically charged by the laser—the reaction to create a molecule could occur. "It's true that for every reaction," Ni said, "atoms and molecules combine individually at the microscopic level. What we have done differently is to create more control over it. We grab two different species of individual atoms with optical tweezers and shine a pulse of laser to bind them. The whole process is happening in an ultra-high vacuum, with very low air density." Ni said a further step would be to combine atoms in a "ground," or not electrically excited, state, with the goal of creating longer-lived molecular reactions. The hope, she added, is that if one dipolar molecule can be created in the lab, bigger and more complex ones can be, too. "I think that a lot of scientists will follow, now that we have shown what is possible," Ni said. "This study was motivated by a few different things. In general, we are interested in a fundamental study to see how physical interaction and chemical reaction contribute to making phenomena complex. We wanted to take the simplest case, the laws of quantum mechanics, which are the underlying laws of nature. Our quantum pieces will then build up to something more complex; that was the initial motivation. Certainly the work is not finished, but this is one breakthrough step." This means your laser is formed from atoms! The molecules can never be formed without the presence of an atom, and especially from the laser that is the photon of a photon. You use a masseur, not a laser. Do you know how a hydrogen atom is formed and the other elements from it? Your deity, to whom you are praying to show you something and helping you to understand what is not clear to you, is your model. Make a golden calf, like an old Jew, and pray to help you figure something out. What these scholars say is totally illogical. Can you briefly describe how the matter originated and what was it formed from? All that is written in some books, and which must be paid to see it, it is concealed "dark knowledge", such as the dark matter invented by those who do not know the structure of unicenter. Here, I will tell you in one sentence how the matter and the hydrogen atom arise. Compare this with this theory and the book you are recommending. The substance arises from the substance Aether which fills the infinite universe. It is formed by the laws of the Spiritual Entity of the universe. and the electron begins to circulate around the protons and this is the hydrogen atom. Everything is explained on 1/10 pages. I call you and the author of the book on a "scientific duel." From your site, I could not conclude that you understood the structure of the universe. You do not know the causes of the formation of matter and the appearance of gravity and magnetism. If you take as a basis for your work, the appearance of BB, your knowledge of the universe is null and void. I like to mention the substance Aether, which was rejected by science because it is incomprehensible to its level of consciousness. You also learn: everything in the universe is formed by Aether, and that is matter from which various energies and phenomena such as magnetism and gravity form, which without Aether can not function. It means that you do not even know what is matter, gravity, magnetism, and how and from what it originates.